The number of detected exoplanets has increased dramatically over the last two decades, creating a huge sample of objects that make deriving robust statistics a lot easier. If you additionally consider that the underlying physical regime for planet formation doesn’t require any fancy stuff, such as quantum mechanics or general relativity, you might conclude that explaining planet formation must be a piece of cake for astrophysicists! However, the reality is far from simple. Planet formation is one of the biggest riddles in current astrophysical research. What is it that makes it so difficult to understand planet formation? There are plenty of models and theories for planet formation, but none of them are free of assumptions. A common assumption is to start with a few larger solid bodies of about a kilometre in size, but how do these form from the protoplanetary disk in the first place? A popular scenario for the formation of such solid bodies is that small dust grains collide and stick together. On first sight that sounds reasonable, but there are two barriers for the solids to overcome during their growth. The bouncing barrier – overcoming it with sticky ices? The first barrier is named the “meter-size barrier“, which describes the dilemma that solid objects of approximately meter size only remain inside a gaseous protoplanetary disk for a short time. The second barrier, called the “bouncing barrier”, describes the effect whereby particles bounce of each other rather than stick together above a velocity dependent size of the dust grain. For spherical silicates – a fancy word for sand grains – a typical growth limit occurs at around mm in size for velocities of the order of cm/s. If solid bodies form via sticking of smaller grains, how can you overcome this barrier? Consider you are in a protoplanetary disk around a star: What happens if you move further away from the star? The temperature decreases – and that has an effect on the molecules in the disk. For a given temperature of the star, molecules freeze out at certain distances from the star and occur in ice forms instead. If you have ever built a snowman, you know that it is much easier to build a big snowball instead of a big clump made of sand. Indeed, recent experiments showed that water ice grains stick much better than silicates. (For a given velocity, they stick to about ten times larger sizes). Therefore, a common rule of thumb for astronomers is: forming larger bodies is much easier once you have ices. However, not all molecules in protoplanetary disks are water molecules. Ices built from other molecules might stick differently; the authors of today’s paper study the sticking properties of ices from another common molecule in the protoplanetary disk, namely CO2. 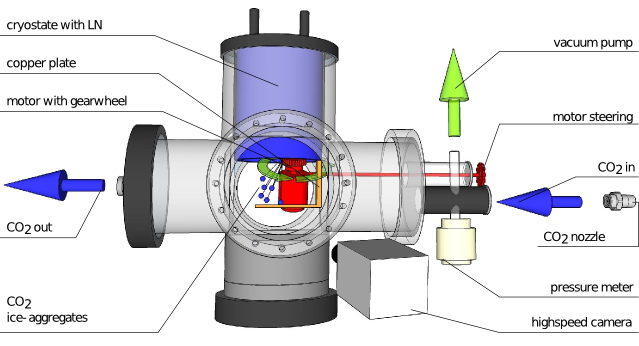 In order to test CO2 ice grain collisions, the authors carry out an experiment with a gas chamber filled with CO2 (Figure 1). CO2 then freezes at the cryostat and on the copper plate resulting in a layer of CO2 ice. By activating the motor with gearwheel, CO2 ice grains of about 100 micrometer in size can then be bevelled from the top layer. These grains subsequently collide with the CO2 on top of the copper layer and conclusions about their sticking probabilities can be drawn. The authors find that CO2 ices stick very similar to silicates, thus far worse than water ices. As a curious physicist, you may wonder want makes water stick so much better than silicates or CO2 ice grains. The reason is a particular property of ice: water has a strong dipole moment, whereas CO2 is not a dipole. CO2 ice is less sticky than water ice – Three zones in the protoplanetary disk? How does this result affect our picture of planet formation? Considering that CO2 freeze at lower temperatures than H2O, and thus at larger distances from the star, the authors conclude that there will be three main zones relevant for sticking (Figure 2). First, inside the ice-line of water sticking is difficult because water is only in gas form and collisions occur only among silicates. Second, in the region between the ice-line of water and the ice-line of CO2 solid growth is supposed to be much easier because of the enhanced stickiness of water ices. Third, in the region beyond the ice-line of CO2, ice-grains are considered to be coated with CO2 and thus growth is difficult similar to the inner zone. Is this realistic? Having such a constant temperature profile and a perfect layering of grains is certainly a simplified model of what real protoplanetary systems are like, but their results are still useful for understanding the dominant processes. Their main point, that ice does not necessarily correspond with higher stickiness, is robust. Moreover, given that solid bodies grow due to sticking of smaller grains, the conclusion of a sweet spot for sticking between the water ice line and the CO2 ice-line suggests an enhanced formation of water-rich planets, and maybe planets in general, in this zone. If we further assume that planets won’t move during the evolution of the disk (in astronomers’ jargon: the planets form in situ and do not migrate), we would expect to detect an enhancement of water rich planets inside zone 2. That is an exciting result, but be careful: Planet formation has been and will be a complicated story. Even though water ices stick easier, they still have to overcome the meter-size and bouncing barrier. The popular interpretation is that a few collisions occur frequently enough and with low enough velocities such that you get “lucky” winners that eventually may grow to solids of several meters. However, whether this is the case in protoplanetary disks remains to be answered in the (hopefully near) future. Finding dust grains (and planetesimals?) in a circumstellar disk An Overview of the Extreme Solar Systems III Conference Chondrule formation by shocks? Chondrules are old and everywhere – are solar system’s solid bodies built by them? I wonder if turbulence in the dusk plays an additional role? This is analogous to increased clotting seen in blood under such flow situations . There is an underlying chemical process ( clotting factors ) that contribute but ultimately it is stagnant areas in the flow created by turbulence ( due to say a damaged heart valve or heart arrhythmia) that allow individual blood cells to come in to the close contact at the kind of low velocities that allow the chemical process to kick in and moves things on to the nex phase . I wonder if similar flow conditions exist in a protoplanetary disk that allow the low velocity sticking together ,due to the melting of various ices, of smaller particles of mass that eventually allows the build up of successively larger bodies till gravity takes over. As far as I understand, turbulence does play a major role in planetary formation. There is a zone close to the center of the section, called the dead zone, where turbulen activity is much lower than on the surfaces. This zone is hidden by a thick cover of dust and ices, so it is less affected by the solar winds and high temperature than the inner zone. Furthermore, it is not far away enough to experience gravitational fluctuations. Also, the surfaces are subject to a large number of instabilities (Hall effect, Magnetorotational instability…) that do not affect the center of the disk. Therefore this dead zone is calmer than the rest of the disk, and is a favourable place for planets to form. Thanks. Nice to know I wasn’t completely wrong. To continue the medical analogy further, once a small clot has formed due to the interaction of turbulence and the chemical factors associated with clotting ( and analgous to ice sticking in aggregations of small mass bodies in a protoplanetary disk ) , the physical presence of the clot itself further increases turbulence locally creating a positive feedback loop in the process . I wondered if this could help support the critical ices “sticking” phase until gravity can eventually take over. I’m no expert on flow dynamics though nor have access to the sort of sophisticated simulation programmes that might illustrate this. NASA having found silicates in the ice balls we call comets, we now have a combination of high temperature silicates and low to medium temperature water ices. Aimply more questions to answer.